Stranger Things is a peculiar beast among the swarm of modern reboots and sequels fueled by nineteen-eighties nostalgia. Although the show is neither reboot nor sequel, it is perhaps the finest experiment of whether or not nostalgia can carry the entirety of one’s story. 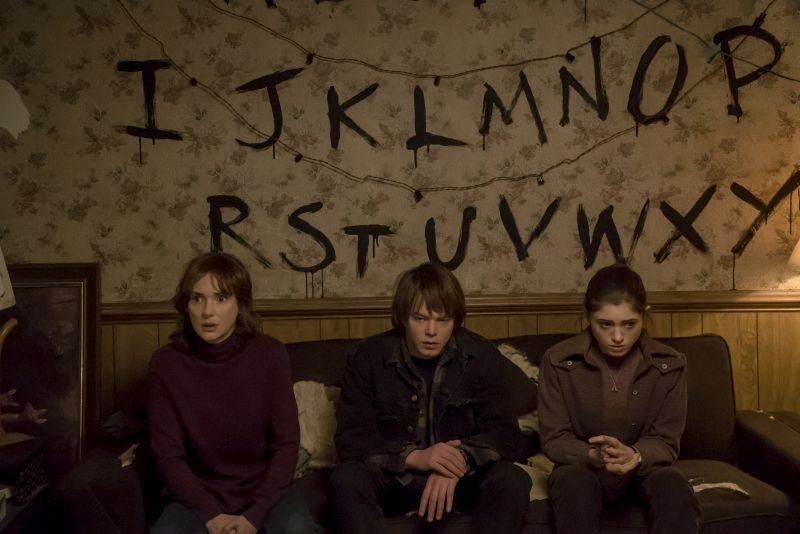 In fact, Stranger Things works a lot like nostalgia. It is endearing for a bit, but one soon becomes bored and hopes that their present story will be more interesting. If the huge text reading “HAWKINS, INDIANA 1983” in Stranger Things’ pilot’s cold open does not indicate that the show takes place in the eighties, its following scene surely does the job. We are introduced to the show’s four child leads playing Dungeons and Dragons in a basement and the scene establishes the dynamic between the middle school boys. Mike (Finn Wolfhard) is the leader, Lucas (Caleb McLaughlin) is the friend who often clashes with the leader, Dustin (Gaten Matarazzo) is the fat comedic relief who works as the group’s mediator, and Will (Noah Schnapp) is the most innocent and shy of the boys. Stranger Things’ catalyst occurs mere minutes after this scene. Will rides his bike back to his dumpy house that looks like it geographically borders the show’s small town and the outskirts of Shrek’s swamp. Home alone, the silhouette of something otherworldly chases Will. Before we can get a clear indication of what is chasing him, Will suddenly vanishes. 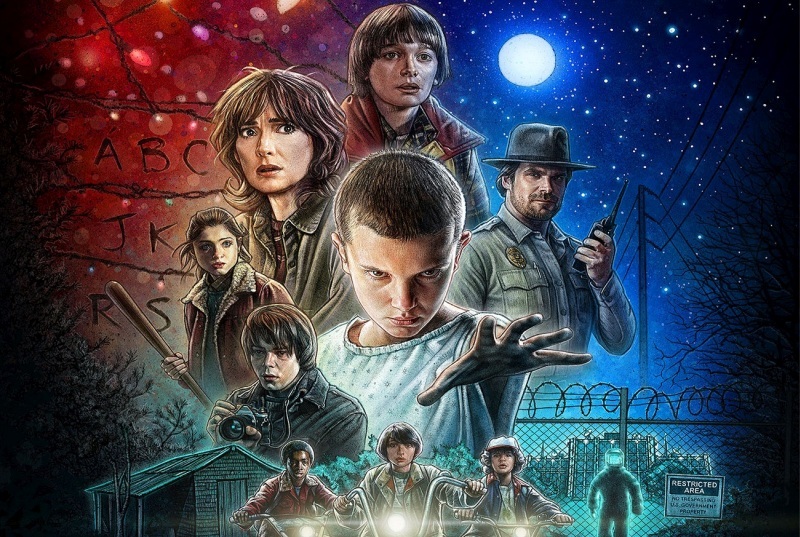 The juxtaposition between the lightness of the boys’ introduction and the intensity of Will’s disappearance scene encapsulates Stranger Things’ two main creative influences. Eighties Spielberg/Amblin entertainment mixed with a John Carpenter creature feature. Moments later the show introduces Will’s single mother, Joyce (Winona Ryder), and her oldest son Jonathan (Charlie Heaton). Joyce reports the disappearance of Will to the local Sheriff Hopper (David Harbour) and the two characters spend the rest of their screen time investigating the mystery of her son’s disappearance. Separate from Joyce’s plot, but not at all unrelated to Will’s disappearance is the character Eleven (Millie Bobby Brown). 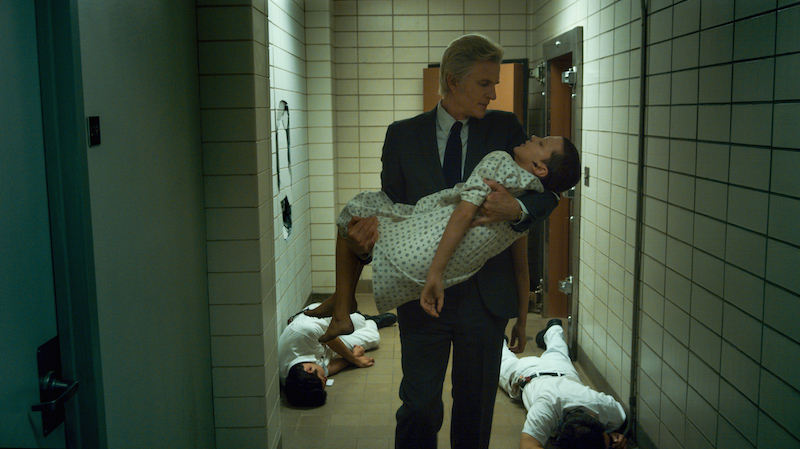 The little girl escapes from a government laboratory (that is connected to the show’s larger mythology) ran by the ominous Dr. Martin Brenner played by a GQ’d, silver foxed Matthew Modine. Through circumstance, Eleven ends up in the company of Mike and the boys. Not only does Mike and co. discover Eleven may know information about Will’s disappearance, but they also find out she harbors some pretty rad telekinetic powers. The boys decide to keep their parents out of their plans and agree to enlist the help of Eleven in order to find Will. In its broadest description, Stranger Things’ main plot is about how Will’s disappearance directly affects all of its characters. Created by Matt and Ross Duffer (Wayward Pines), I never doubted the brothers’ creative vision for Stranger Things was rooted in the right place. By the show’s second episode, it is clear the creators not are only concerned with eighties pop culture nostalgia, but also want their story to capture the magic and mysticism of an Amblin entertainment. It is a show, not a movie. Ultimately, this is Stranger Things’ biggest missed opportunity. Serialized television gives its creators the chance to add dimension to their characters and stories as rich as any novel. 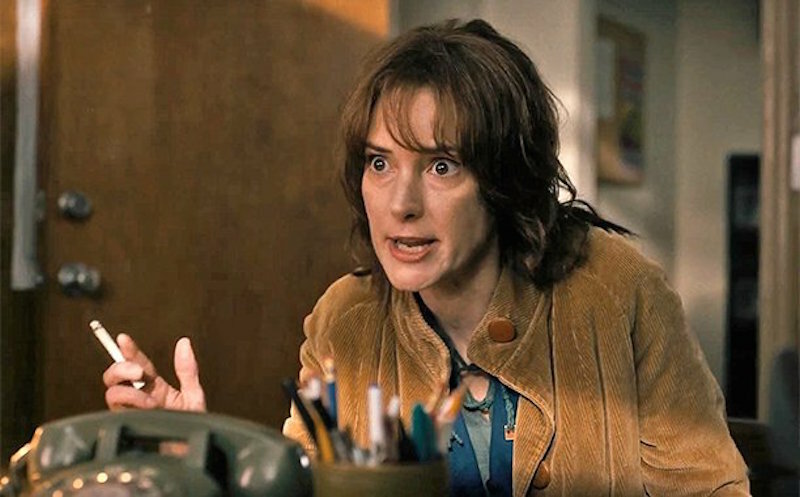 Conversely, the characters in Stranger Things have arcs that I either saw coming from a mile away or are only there to shallowly service its plot. Stranger Things is the type of show where middle school bullies are jerks for the sake of being little jerks so our heroes can do something cool to retaliate. I would have thought this beat was supposed to be a throwback to the eighties movie bully archetype if it was not repeated over and over again throughout the show. Also, it does not help that the Duffer Brothers’ script and their directorial choices tend to off balance one another. For instance the character of Sheriff Hopper, on paper, has a sufficient arc that both falls in line with how he is established and the show’s thematic premise. Yet, the overall execution of Hopper’s arc is ill serviced by the Duffer Brothers’ other creative choices such as ham fisted editing. This is not to say that the Duffer Brothers are outright terrible directors. They definitely have an eye for clarity and present their images with professional sleekness. 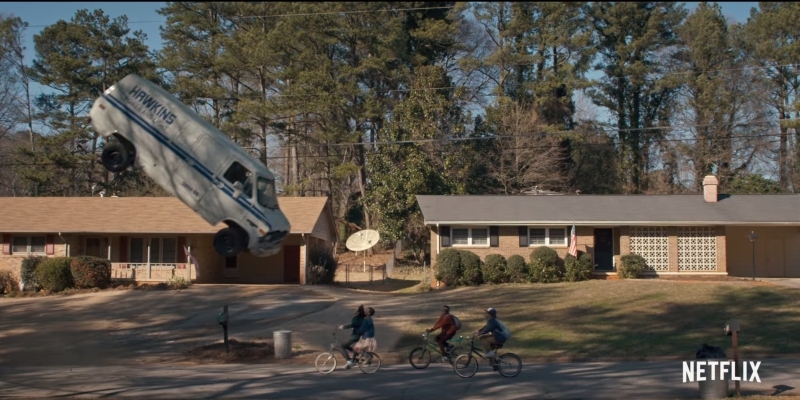 Stranger Things’ script is also not helped by many of its performances. The most glaringly distracting performance is Winona Ryder’s Joyce. Appropriately, Joyce acts frantic and scared over the disappearance of her son. But, before Joyce even finds out Will is missing she is established as being frantic and scared. I dare someone watching the show to find a scene where Ryder is not yelling and holding a tiny a cigarette in her hand. Her character is more defined by these tics than any other deeper traits. Joyce is the result of a character that is essentially arc-less and a failure on the part of the actress playing her to elevate the material. It is disappointing to feel this way about her character especially when most of the show’s emotional weight rests on her shoulders. Oppositely, all of the child actors play their respective roles well. Millie Bobby Brown’s performance as Eleven is quite empathetic and she showcases a wide range of emotions well. Finn Wolfhard’s performance does a nice job portraying his character’s curiosity and sense of adventure, successfully encapsulating the tone Stranger Things always strives towards (it also does not hurt that his face looks like a kid straight out of E.T.) In fact, the kids’ storyline is where the show pops the most and comes closest to capturing its intended feel. Which brings me back around to Stranger Things’ use of nostalgia. 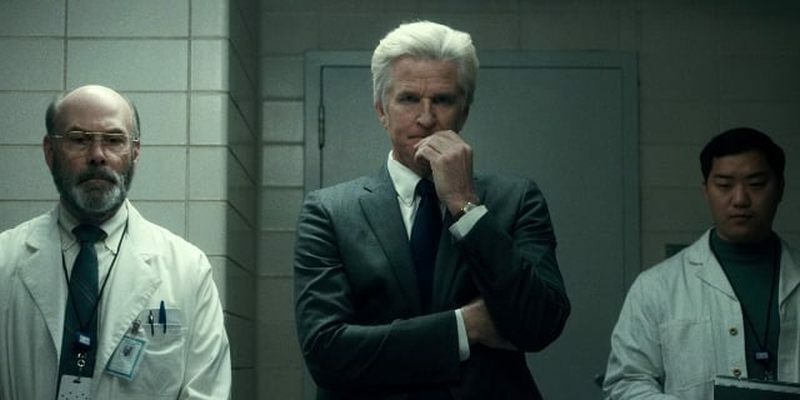 After the show’s first few episodes make references to John Carpenter’s The Thing, Stephen King’s Carrie, and Star Wars, the Duffer Brothers realize that they must tell their own story. Not that there is anything wrong per se taking with taking queues from other films, but the creators never add anything particular new to their show’s Spielbergian story beats. Although the first episode creates a monster (or is it something else?) scene that is John Carpenter-esque, all of Stranger Things’ subsequent episodes seem less interested in its proposed mythology. The monster scenes should feel like something the show truly wants to explore, but they end up seeming like an obligation to the pilot’s promise. As a result Stranger Things’ mythology feels confused, rather than purposely incoherent. There is actually a sense of obligation that permeates throughout Stranger Things’ storytelling. For example, there is a scene that tries to tie in its mythology with the Cold War, but it never amounts to anything more than a glorified call back. I could not help but think these scenes were in the show to solely remind the audience that the series takes place in the eighties. Thematically, Stranger Things is ultimately about people’s different approaches of dealing with grief and traumatic family events. The theme feels rather timeless and could really be told in any era. Before closing, let me say that I do not find anything inherently wrong with using nostalgia as a jumping on point for creators to tell their stories. Nostalgia is completely human, natural and often beautiful, but it is normally compromised of memories that feel completely organic. Stranger Things never feels like its heart is in the wrong place, but it rarely feels natural. It is no secret that Stranger Things’ creative influences, Steven Spielberg and John Carpenter, were inspired by 1950’s science fiction films when they made their own movies. Should there be a second season of Stranger Things, perhaps the Duffer Brothers will learn to similarly approach their material like those filmmakers by taking something they love and making it fresh. Thought it was an excellent review. To the point but the right amount of information to let people make their own decision to see it or not….Great job….